What is the fiscal infrastructure of colonialism? It is a bare-bones cash transfer program that Indigenous Affairs manages to produce a state of permanent austerity on reserves. It is a funding program that has been weaponized against First Nations nationally. In January 2017, two young girls took their lives in a suicide pact at Wapekeka First Nation. Desperate for mental health workers, the First Nation — a fly-in community 600 kilometres north of Thunder Bay — requested $376,706 in emergency funding from Health Canada. According to Nishnawbe Aski Nation Grand Chief Alvin Fiddler, they were told it was an “awkward time” to be considered for funding approval. A few years earlier, the federal government chose a curious time to send the Canada Revenue Agency and Aboriginal Affairs into Elsipogtog to collect overdue bills. They came knocking at the height of the community’s anti-fracking protest against SWN Resources, which shut down highways in New Brunswick — years after the debt was incurred. “They are really pulling the financial strings hard,” stated band councillor Scott Sanipass to APTN News. Aboriginal Affairs threatened to hold back tuition payments and almost a million dollars owed to the band, in addition to 15 per cent of the band’s annual funding, until the amount was paid back in full. What ties these cases together, and so many others like them, is a document that all First Nation bands and organizations must negotiate with the federal government to release core funding. For most communities, federal transfer payments are the sole source of income. So if First Nations rely on the government for most of their money, we need to look at what Ottawa does with the power this implies. Instead, the public has been staring down the wrong end of the barrel, obsessed with First Nations poverty rather than by its deliberate creation. Yet when the news focuses its lens on moldy, dilapidated homes or suicide epidemics on reserves, the way poverty on reserves is managed by Ottawa is rarely publicly scrutinized. A sanitized language of “disparity” has emerged to describe the vastly different social and economic outcomes for Indigenous peoples and the rest of Canadians. But for 200 years, fiscal policy has been an object of colonialism as lands were (and continue to be) dispossessed for settlement and resource extraction. Since the early 19th century, one debate has been at the centre of Crown-Indigenous fiscal relations: whether, to what extent, and to what end the federal government should offer “assistance” to Indigenous peoples destitute as a result of disease, hunger, and loss of land. The vast majority of Indian Act reserves persist today on a federal life support system as a result of this dispossession. Or more accurately, as a result of Canada’s denial of Indigenous jurisdiction over their broader traditional and treaty territories. The architecture of this fiscal system is a complicated administration of funding arrangements that replaced earlier economic tools based on treaty relations, relief provisions, and ad hoc social assistance schemes. 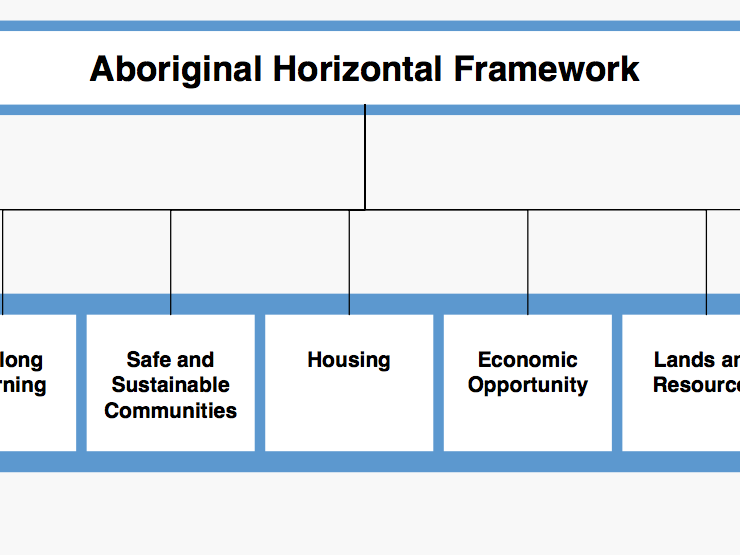 The majority of this spending never passes through a band council’s hands, but rather is managed through a complex bureaucracy laid out in the Aboriginal Horizontal Framework — a cradle-to-grave system of federal oversight over nearly every aspect of Indigenous life in Canada [Figure 1]. Throughout the 1990s until today, numerous reports, audits, Royal Commissions, and Auditor General of Canada reports have cited the palliative nature of federal transfer funding to First Nations. Identifying chronic underfunding as a core concern, these evaluations consistently note that rigidly administered fiscal programs serve to prolong First Nations dependency in what we may call an indefinite limbo of permanent austerity. The spending that First Nations ostensibly control is mostly transferred in Contribution Funding Agreements that provide a core operating budget for band councils and funding for basic services and programs. But this funding barely covers costs. Discrepancies in education, housing, and health spending between First Nations and other Canadians are not an accidental oversight. They are the product of deliberate tactics of fiscal brutality. The current system of federal transfer payments evolved over a number of years. Throughout the 1950s and early 1960s, the federal government made efforts to disentangle itself from the poverty on reserves owed largely to broken treaties and loss of lands. An Assembly of First Nations report describes how there was also increased pressure to provide services to First Nations at this time, services that were available to Canadians more generally with the post-war expansion of government social programs. But these new services offered no rights to economic benefits from treaty and traditional lands. Instead, new programs locked First Nations into social assistance programs with no prospect of real economic development and self-determination. Canada still hoped that the Indians would become Canadians. In that case, the funding burden of respecting nation-to-nation relations could be removed once and for all. In the backlash to the White Paper of 1969 that boldly promoted this kind of assimilation, Indigenous peoples fought for the establishment of core funding for Aboriginal organizations and won. But it was short-lived when widespread devolution programs were introduced in the 1980s as the Tories set out to shrink the government and deficit. Neoliberalism affected all Canadians at the time. But the distinct nature of the fiscal crisis on reserves separated Indigenous peoples from most other citizens. To take just one example, more than double the number of homes on reserves than elsewhere were in need of major structural repair. First Nations were also alone among Canadians in the high incidence of settlements lacking indoor plumbing and proper water sanitation. Indian Affairs’ federal officials dubbed their devolution of services “the buffalo jump,” a reference to a hunting technique practised in the prairies by Indigenous peoples for thousands of years, which involved killing prey by expertly luring and chasing them off a precipice. The animals would be carved and cooked in a camp below. The buffalo jump was technically a program review that recommended most federal responsibilities towards First Nations be transferred to the provinces and bands. Expenditures related to housing and infrastructure came under particularly severe attack, recommending “exit strategies” in funding by abolishing programs, cutting health care and post-secondary education, relaxing standards in infrastructure management to ensure that “modern suburbs in the northern bush” were not created, introducing privatized program and service delivery, and removing incentives such as housing benefits for families to remain on reserves with high unemployment. Two major setbacks dogged the proposed target reductions in First Nation spending laid out in the Mulroney program review (dubbed the Nielson Report after its author). Unforeseen government expenditures arose when in 1984 the Supreme Court of Canada found in Guerin v. The Queen that the Crown had legally enforceable fiduciary obligations to First Nations. A year later, Aboriginal women’s rights introduced through Bill C-31 doubled the number of status Indians in Canada, dramatically expanding the population for which the Crown held fiduciary obligations. New strategies of fiscal brutality emerged to constrain the Crown’s fiduciary duties and to “balkanize” Indigenous groups through fiscally driven distinctions based on status. Austerity programs were also accelerated so that expenditure reduction targets would be met. As George Erasmus wrote in Drumbeat, around two thousand students were denied funding for post-secondary education during this period. The lure of increased local control hid the precipice of deficit reduction objectives and also the fact that the ultimate authority for determining funding allocation remained firmly entrenched with the department. When the Chrétien Liberals took power and inherited the Tories’ massive deficit, they carried out their own government-wide program review in 1994-95 to promote austerity, introducing growth caps on Indian Affairs and further cuts one year later in a subsequent program review. The department’s budget scaled back to 2 per cent growth by 1997-98, ensuring that funding would not keep up with the demographic growth of Indigenous communities or with inflation. “Core obligations” to First Nations were also formally redefined as water, sewage, social assistance and education, cementing the bare-bones policy. Under Stephen Harper, the formulas changed slightly, with some “flexibility” built into the way inadequate funds were delivered, but with all recourse to contestation still stripped out. The introduction of the First Nations Financial Transparency Act spelled out most clearly Harper’s intention to play the blame game of poverty. He sought to add another layer of bureaucracy to First Nations accounting by forcing bands to post their consolidated financial audit online for the country to scrutinize. So odious was the transparency at to bands — Haisla-Heiltsuk author Eden Robinson called it an act of public shaming — that compliance with it was written into Contribution Funding Agreements as a condition for release of the money. The cuts followed the Idle No More movement that united Indigenous communities across the country in opposition to Harper’s agenda of “economic modernization” on reserves and environmental deregulation. Trudeau is doing what he does best: a public relations campaign about fiscal relations, rather than making any meaningful change. The 2 per cent cap implemented by the previous Liberal government was finally lifted. But the “disparities” continue to grow. A Canadian Human Rights Tribunal ruled that Canada discriminates against First Nations children by failing to provide the same level of child welfare services provided for non-Indigenous Canadians. Since the ruling, the tribunal has been forced to issue three compliance orders to the Liberal government, which has failed to step in to provide funding parity. Instead, Trudeau is doing what he does best: a public relations campaign about fiscal relations, rather than making any meaningful change. In that regard, he is doing his favourite thing, which is setting up a process. The First Nations–Canada Joint Committee on the Fiscal Relationship with the Assembly of First Nations has given itself until the end of the year to complete its work, which is to negotiate a new fiscal framework with the federal government. The goals of the committee include the provision of sufficient funding. Though $18 billion has been promised in the Liberal budget for First Nations, all of this money is reserve-focused funding: the 0.2 per cent economy. And most of it will not even be released until after the next election in an attempt to lead people along. Blueprints for change, however, abound. The Penner Report recommended that bands should be considered equivalent to provinces and receive financial support on those terms, as a distinct, constitutionally-protected order of government. A coalition of prairie chiefs including Peepeekisis First Nation proposed to redesign Contribution Funding Agreements to receive direct funding from the Treasury Board, which was ignored. Idle No More and Defenders of the Land are calling for a national day of action on July 1 in honour of Arthur Manuel and in support of Indigenous self-determination over land, territories and resources. Footnote Communities under self-government agreements operate under separate funding formulas, but these currently apply to only 36 communities. Some communities secure “own source funding” outside of federal transfer funds and according to a Fraser Institute Report on the 2013/2014 year, over 100 communities (from of a total of over 600) generated more OSR than they received from the federal government (“Government Spending and Own-Source Revenue for Canada's Aboriginals: A Comparative Analysis,” March 10, 2016).